She put her faith in this vine, just as her mother did, and it bore her fruit. For as long as Norma de Lora could recall, the agsam vine, a plant endemic to Surigao del Sur, supported the needs of their brood of nine as her mother made and sold agsam bracelets to supplement the family income. Today, it isn’t just Norma, 59, who depends on the agsam for some extra cash in the family coffers. “I buy my raw materials only from the Mamanwa folk because they know the right kind and of vine to pick,” Norma said of the indigenous people living in Surigao del Sur. “My neighbors, on the other hand, weave these into accessories which I buy from them. Running my business this way helps everyone,” she added. In the past, the vine did not have much use; people picked its leaves for decorations, recounted Norma, Agsam leaves had the quality of plastic and were often used to embellish the stage during an event. The vine was brunt because people thought it was useless. 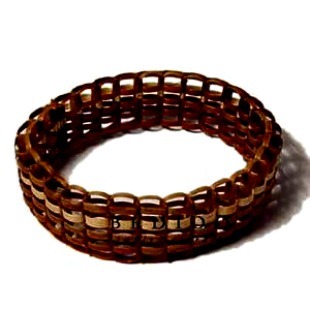 She couldn’t remember how her mother, who is now in her 80s, learned about the vine’s elastic properties, but what is clear in her memory is that her mother spent hours weaving the vines into bracelets, which fetched a good price at the market. What sets the agsam bracelets apart from the usual accessories is the peculiar way to use it: the piece has to be submerged first in water for a few minutes so it would loosen enough to slip on one’s wrist. Upon drying, the piece becomes a snug fit. This is known as the wet n’ wear bracelet. Processing the stalk begins by submerging it for a couple of days in mangrove mud, which acts as a natural dye and gives the agsam a nice, earthy tone. The hard part is letting it dry because it should be air-dried but not soaked in direct sunlight. The drying process usually takes a day or two. When the process is done correctly, the vine achieves maximum elasticity. The dried vines are then handed out to weavers. Of about 100 houses in barangay Nurcia in Lanuza, at least 90 houses had residents who knew how to weave agsam, giving Norma a sizeable group to engage in business. An expert weaver can make up to 15 bracelets or necklace a day, and one bag every three days. Norma buys these products and sells them for a profit through her business, the De Lara Agsam Novelties. The town of Lanuza became so renowned for making agsam products that it was named Surigao del Sur’s Crafts Village. For the past decade, the vine has provided a dependable income source for the de laras. She had a sturdier house built and brought a service vehicle, which she uses for deliveries. Like many small-town folk, Norma left Nurcia and her mother’s little agsam enterprise when she was young to move to Davao, where she met the man who would become her husband. In 2002, she decided to go back home, bringing her family to Nurcia. During this time Norma became an agrarian reform beneficiary under the Department of Agrarian Reform’s leasehold scheme and joined the Lanuza Agham Crafts Development Cooperative. Her Manila sojourns allowed her to touch base with the Department Trade and Industry, which provided further technical support for the enterprise. The DTI certified Norma’s products as having passed the standards set by the agency.